Armed with digital cameras, my good friend Lee Brown (blog author of A Day Not Wasted) and I set out early Saturday morning in search of natural beauty. Our mission: to capture eye-catching water photos at Helen Hunt Falls in North Cheyenne Cañon Park. Unfortunately, the splendor of the falls lay hidden beneath ice and snow. Determined to make the most of our photo trek, instead we turned our camera eyes on the local architectural beauty of Pauline Chapel near the Broadmoor Hotel. 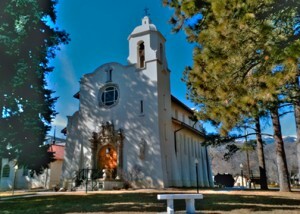 The Pauline Chapel, built in 1918, is a notable example of the Spanish Colonial Revival style. I achieved multiple exposures using the iPhone app SlowShutter to produce three exposures (+1EV, 0, -1EV). 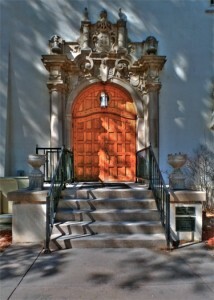 By applying Photomatix Pro, the three different exposures were combined into a single image. I then used Photoshop’s Lens Correction filter to reduce the barreling effect of the wide-angle lens. Our final stop was the Garden of the Gods to catch the last southerly morning sunlight. Perching my tripod on a ridge south of the Gateway entrance, I shot a panorama series facing west towards Pikes Peak. I used the iPhone app Pro HDR to create the HDR composite, then later on my computer, used Photoshop’s Photomerge feature to blend four panorama frames. 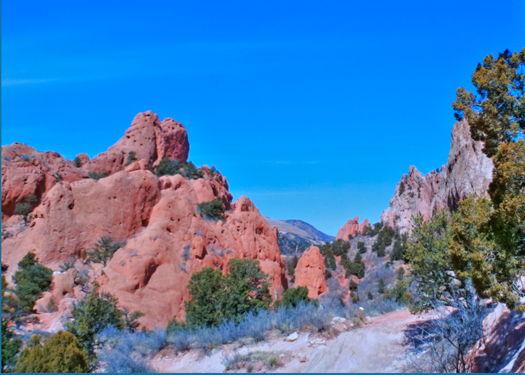 Garden of the Gods Park, looking west toward Pikes Peak. The photo below was taken using the standard iPhone camera app. 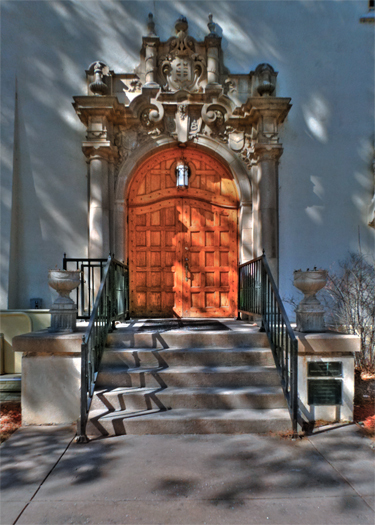 By tapping on light, dark and intermediate tones, iPhone’s white balance function effectively created three different exposures, which were composited in Photomatix Pro to create the final HDR photo. Garden of the Gods Park, facing north. This panorama was created from five separate frames held steady with the aid of my tripod. Only the standard camera iPhone app was used along with Photoshop to create the final composite image. Minimal retouching was applied. Balanced Rock, Garden of the Gods Park. Concluding thoughts: the iPhone camera offers remarkably high quality point-and-shoot functionality, which can be enhanced by the Owle Bubo and iPhone apps. SlowShutter is an intriguing app that enables manual exposure value (EV) control and virtual shutter speed adjustment, but its lack of tap-focus integration is problematic. Photomatix and Photoshop are indispensable, high-end software that produce stunning photos for pros and hobbyists alike. For those interested in achieving HDR results on a limited budget, Pro HDR and Photoshop.com Mobile app produce great results right on the iPhone, without the need for a high-performance computer and expensive software.